George Robertson Jack was born in 1887 in Tower Hamlets, London but relocated to Canongate in Edinburgh with his parents at the turn of the nineteenth century. By 1901 at the age of 13, he had three siblings: Atholl (11), Alice (5) and Henry (3). He was working as a plumber in 1917 when he married dressmaker Euphemia Ballingall Kirk. The couple settled in Burntisland where their son George Jnr was born in 1918 followed by a daughter Jane in 1921. Both children emigrated to Australia and died in 1978 and 2002 respectively. Sadly, Euphemia died of cancer in January 1935, but George married again in 1938. By that time he was a Plumber’s Manager living in Grierson Gardens Edinburgh, and married Mary Johnston Bisset, housekeeper. George died at the age of 75 in 1963 and was survived by his widow who passed away 18 years later. Although not born here, George’s roots were in Scotland. Both his father and grandfather were named George and were working class. Grandfather George was born in 1803 and married Margaret Drummond in 1833. He was a tailor and she was daughter of a tailor, both living in Leith. There is no record of grandfather George’s death, but he and Margaret had three children in Leith: Anne (1836), George (1844) and Mary (1846). By 1852 however, Margaret (as a widow) married a blacksmith, George Robertson from North Leith and he became stepfather to her three children. George Robertson seems to have been something of an entrepreneur as he evolved from blacksmith to warehouseman clerk, to grocer, to spirit merchant to carting contractor! He must have gained the respect of his step children as George Jack took Robertson as his middle name and his own children followed in the trading footsteps of their stepgrandfather. Margaret and George Robertson lived out their lives in Hawthornbank Terrace, Leith. Margaret’s elder daughter Annie was their housekeeper to the end. Margaret died aged 88 in 1898 and George Roberston died five years later. At 17, Margaret’s son (father George) is recorded as being a clerk in a commission agent’s office in Leith, but by his thirties he has moved to London as a trader. He marries Alice Mary Clark in Bethnal Green in 1886. They have three children in England: George (1887), Atholl (1889) and Alice (1895) before he returns to Canongate, Edinburgh where he works as a coke checker for a gas company. Henry arrives in 1898. Tragedy hits the family in 1901 when 35 year old Alice dies in childbirth. Less than two months later in 1902, father George dies of asthenia. Who will look after the family? We find the youngsters registered as boarders with Shipmaster William Torbert and his trader wife Euphemia in Ladybank, East Fife. At the time of the 1911 census the girls (employed as linen weavers) were visited by brother Atholl who is now a shop assistant. Their elder brother is lodging at Valleyfield Street, Edinburgh and making his living as a plumber. 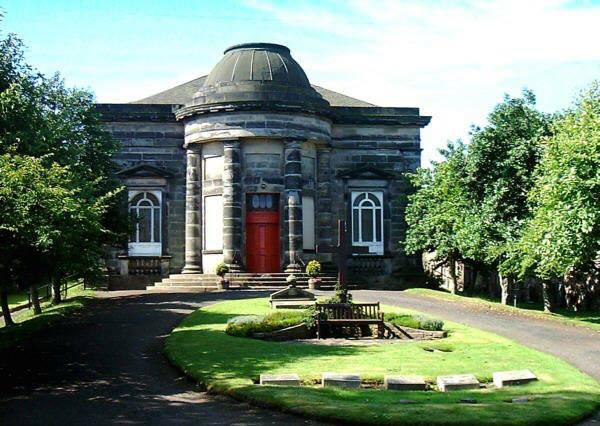 Strangely, none of the family marriages take place in the Episcopal Church in Portobello, so it is uncertain how plumber George Robertson Jack is buried within its grounds. The only (possibly tenuous) link is that his mother Alice may have attended the ‘English Church’ upon her arrival in Edinburgh.